Raw materials form the basis of the entire industrial value-added chain. Industrial products like smartphones, cars and heavy machinery consist of a number of different raw materials, many of which have to be imported from all over the world for manufacturing operations in Germany and Europe. According to the European Commission, over 11 million jobs in Europe, located along the entire value-added chain, are dependent on secure access to raw materials. So how can it be ensured that these needs are met in the long term? KfW IPEX-Bank is helping German and European companies to diversify their sources of supply and to satisfy their need for industrial raw materials in a challenging environment. KfW IPEX-Bank finances projects aimed at securing raw material imports to Germany and Europe - also in order to sustainably develop green future technologies. Of all the precious metals, barely any are as versatile as gold. It is primarily used in electrical engineering, such as in electricity networks or computers. However, its main deposits are located outside Germany and Europe. In 2018, KfW IPEX-Bank participated in the financing of the Fruta del Norte gold mine in Ecuador as part of a banking consortium, providing USD 37.4 million for the project. According to the agreement, half of the gold concentrate produced by the mine will be sold to the European company Boliden AB during the first eight years of operation. The Scandinavian company specialises in metal exploration, mining, smelting and recycling. KfW IPEX-Bank helps to secure the supply of raw materials by providing targeted project financing worldwide. For example, it is financing the Fruta del Norte gold mine in Ecuador, providing around USD 37 million of the total investment volume of over USD 1 billion. The reserves of the mine – the largest in the country – are high grade, and production is planned from 2020. KfW IPEX-Bank is providing around USD 300 million towards the financing of the Mina Justa copper mine in Peru. The conductivity of copper makes this metal a particularly attractive option. Long-term purchase agreements between the project company Marcobre S.A.C. and Germany’s Aurubis AG will provide a secure basis for the project. When it comes to primary metals, German industry is almost entirely reliant on imports from abroad. 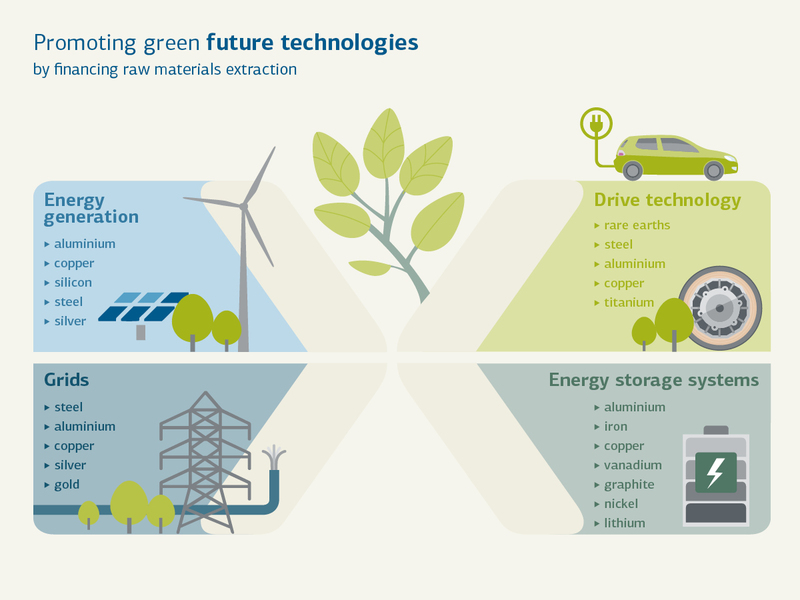 This also applies to copper, a raw material that is required for future technologies, too – owing to its conductivity, especially for electromobility applications. In 2018, KfW IPEX-Bank participated in projects including the USD 900 million project financing for the Mina Justa copper mine in Peru. The bank’s involvement is based on a long-term purchase agreement concerning the supply of copper concentrates produced, which was signed between the project company Marcobre S.A.C. and Germany’s Aurubis AG, one of the world’s largest copper producers and the global leader for copper recycling. Through its participation in the project, KfW IPEX-Bank is helping to ensure the future viability of German and European industry.